TSLPRB Police Constable Answer key 2018 for SET A B C D Download: Telangana State Level Police Recruitment Board (TSLPRB) successfully completed conducting the Police Constable written test on 30th September in many exam centers across the state. Many of the competitors aiming to get constable jobs in Telangana have competed for the police constable written test. To analyze the score by comparing with the answers given by TSLPRB, candidates can download TS Police Constable Answer Key 2018 PDF from the official portal, tslprb.in. 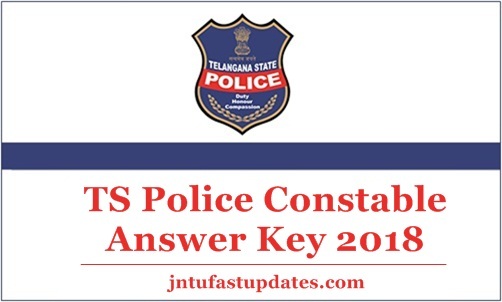 Candidates competed for the test can download Telangana Civil Police Constable answer sheet/question paper solutions for all sets A, B, C, D. After downloading the answer key, candidates can compare with the set they have attempted in the examination. Estimating the score roughly can give the idea regarding the attempt and the probable score that is going to be obtained in the exam. The TSLPRB has recently notified 16,925 police constable posts. The posts announced for Firemen, wardens (Male and Female) in Prisons and Correctional Services Department. The organization accepted applications from interested and eligible aspirants. Lakhs of aspirants hoping to become police constable in the state of Telangana have applied for the announced posts during the application dates. Aspirants applied for TSLPRB Police Constable posts this year have to go through various rounds of selection process include PET (Physical Eligibility Test), PST (Physical Standards Test), Written Test, Interview rounds. As part of the selection process, the TSLPRB conducted the written test on 30th September. Almost all the applicants have participated in the written test round. The department has organized the test in many examination centers across the Telangana state. Aspirants competed for the written test phase of Constable Selection process can shortly download TS Police Constable Answer sheet by visiting the official portal, tslpeb.in. The answer key is expected to release within 3 to 4 days after the examination. Candidates can stay checking the TSLPRB official portal, tslprb.in to download the answer sheet. Candidates can estimate the probable score by comparing the answers with the matching set in Set A, Set B, Set C, and Set D.
The Preliminary Written Test for the Recruitment of SCT PCs Civil and / or equivalent Posts has been conducted in 966 Examination Centres located in 40 Places (almost all the important Cities and Towns) throughout the State from 10 am to 1 pm, today (30-09-2018). Preliminary Key for the above Test will be made available on the official website: www.tslprb.in within a few days (Please keep watching our Homepage). Telangana Police Constable Exam 2018 Question Papers & Solutions, Keys are available now. Candidates will be given 3 days’ time to submit Objections, if any, on Preliminary Key for each question individually in the Web Template made available to them in their respective Accounts. It is once again cautioned that every individual (question) objection, has to be submitted separately, by mentioning the details in the above Proforma. Objections with insufficient information will not be considered. No manual representations will be entertained in this regard. On the homepage, “TS Police Constable Answer Key 2018” Link appears. Click on the link. Provide the Login credentials and tap on the submit button. Now cross check your answers. Sir i got 70 marks in prilims exam held on sep 30 2018 as per final key i got 70 marks which is qualify marks but in result given m not qualify what i should do now sir.. Why tslrpb done like this..